Sherlock Holmes first appeared in print in 1887. He was the creation of Arthur Conan Doyle, a medical doctor who turned to writing after becoming bored when his lethargic practice attracted few patients. He based Holmes after Dr. Joseph Bell, his college teacher who introduced Conan Doyle to deductive (or forensic) science. 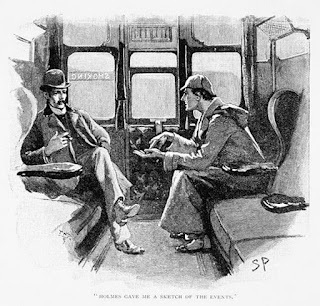 (Holmes’ companion, Dr. John Watson, is based on Conan Doyle himself.) 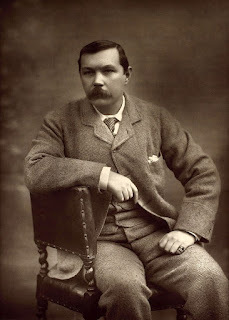 The character soon became a pop culture icon, and Conan Doyle found himself writing new stories at a frantic pace to keep up with demand- usually with a new one in The Strand magazine every month. However, after six years, Conan Doyle was tired of writing about Holmes. Finally, in The Final Problem, he pitted Holmes against Professor James Moriarty, a man every bit as smart and cunning. (Think of him as Sherlock’s evil twin.) In the end, Holmes is only able to defeat the evil professor when both throw each other off the Reichenbach Falls in Switzerland. Conan Doyle spent the next eight years turning his interest towards historical fiction and his newfound interest in spiritualism. 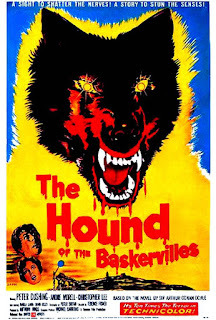 Eventually, (and with some help from Bertram Fletcher Robinson, a journalist and friend,) Conan Doyle began working on a supernatural story inspired by English folktales of demonic hellhounds. (Not hard for Doyle, who hated dogs with a fiery passion.) It centered on a mysterious death in a family allegedly afflicted with an ancient canine curse; a punishment for a sadistic ancestor who’d killed a peasant girl who tried to escape his ‘embrace.’ The story then turned into an investigation to determine, first, whether the death was supernatural or not; and then, second, to find out if death was about to strike again and why. At some point, Conan Doyle decided not to create a new central character to investigate the situation and simply inserted Holmes. The story was dated to take place before The Final Problem, or a case that Dr. Watson (who narrates almost all of the stories), hadn’t commented on before. This is considered to be one of the most iconic versions of the story. 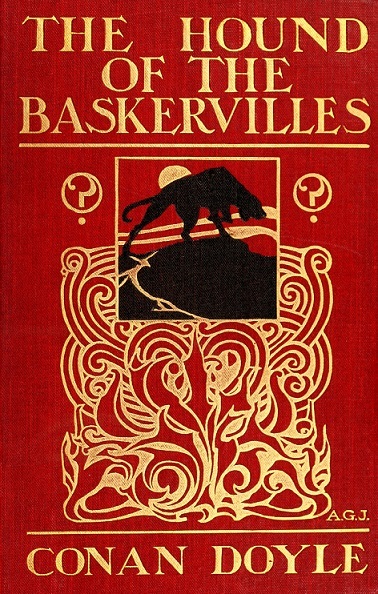 It follows the basic storyline: that of Dr. Mortimer arriving from Devon to ask for Holmes’ help following the death of Sir Charles Baskerville. 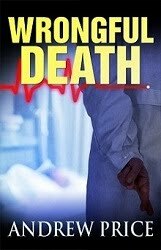 Not only does he have doubts about Sir Charles’ death, but he wants to protect his heir, Sir Henry, from a similar fate. 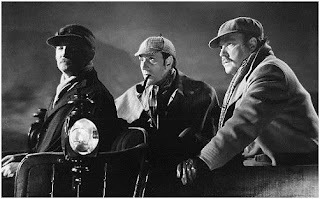 Dr. Watson then heads to Devon with Sir Henry where he notes several suspects who could be behind the whole thing: Barrymore, the butler; Seldon, an escaped convict; Stapleton, an eccentric ex-schoolteacher; and a mysterious man spotted on the moors. This film is beautifully shot. In fact, it was the first movie to show Holmes in native Victorian setting. (Other 20’s and 30’s films had updated the time period to modern times.) However, there’s a strong emphasis on scenes not in the book. (Sir Henry arriving by boat; a séance; an engagement dinner, etc.) The characters are also extremely nice to each other; which is odd for a story in which everyone acts suspiciously and could be hiding something. (John Carradine is given little to do as Barrymore.) And, IMO, the style and exposition makes it feel too much like a Universal horror film of the same time. It really left me wanting more. Watson: Nigel Bruce is the bane of Holmes fans. It’s from his portrayal that we get the idea of Watson being older, fatter, and nothing more than comic relief. Pass. It’s always a little unsettling when filmmakers make more than a few changes to a great story. Usually, said story gets watered down and becomes a huge disappointment. (See my Raise the Titanic review.) Then you get a movie like this and everything just... works! Director Terence Fisher took a LOT of liberties with the story. (See LIST.) Scenes were cut, motives were changed, and one key conflicted character in the text became a villain. Still, it works. 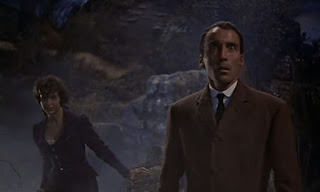 For example: when Holmes meets Sir Henry (Christopher Lee in form as a pompous aristocrat), a tarantula crawls out of Sir Henry’s boot, forcing Holmes to beat the bug to death with a cane. I thought the scene was ridiculous at first. (Not to mention that they’re not really dangerous to humans.) Fisher, however, knows what he’s doing. The spider’s appearance actually helps lead Holmes to the real criminal. In the hands of a skilled director, such invented scenes- along with the recreation Sir Hugo Baskerville’s devious backstory- add to the narrative. It’s also a nice to see the great Christopher Lee, a man known for playing dominating characters, having to show fear as a would-be victim. 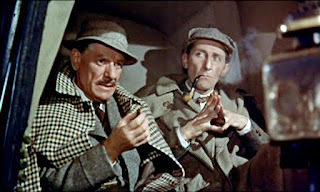 Holmes: Peter Cushing, Lee’s BFF, is pretty good as Holmes. Truthfully, it’s hard (if not impossible) to find Cushing giving a bad performance. It’s just that most of what he does as Holmes has been covered before or since. He, does, however, show Holmes being quite a jerk when interviewing people (a common trait in the canon). Maybe he was calling on his better-known villain instincts? Watson: Andre Morell is faithful, if not memorable, as Watson. He’s not a buffoon. I give him credit for that. But there’s not much more. I call him OK. 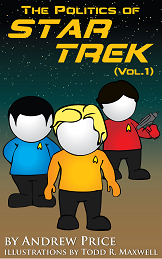 This animated, one-hour special is amazingly faithful to the original story. Some corners are cut here and there, but it’s hardly noticeable. The filmmakers keep up a good pace, pausing only when the drama requires it. What really amazes me here is how well the characters are defined. Barrymore is elusive; Beryl Stapleton is conflicted; Sir Henry is daring, but arrogant; and even the coachman sounds like a Cockneyed, blue-collar guy from London. Heck, Inspector Lestrade makes an appearance with his trademark antagonism toward Holmes. Like I said above, it’s the behaviors and attitudes of the characters that keep you guessing, and this one really is the best at that. Holmes: Peter O’Toole voices Holmes here. I like his performance. The only problem is that it’s a little one-track. 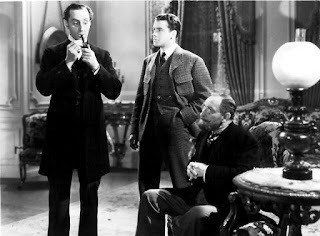 Whereas Rathbone was focused on being stylized and eccentric, O’Toole is mainly cold and brooding. It’s just lacking a little variety. Watson: This version is a cross between Nigel Bruce and Andre Morell. He has Bruce’s appearance, but Morell’s faithfulness to the character. 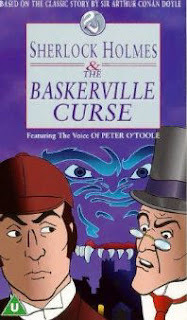 Voice actor Earle Cross skillfully balances Watson’s seriousness with good humor to lighten tense situations. Part of the “Sherlock Holmes” TV series that ran from 1984 to 1994, this version of the tale premiered as a special in August, 1988. The period Victorian settings are lavish, as would be expected of a popular version of Sherlock Holmes tales. But as an added bonus, the scenes of Devon and the moors were actually filmed outside instead of on sets, giving a greater feeling to the ghoulish world Conan Doyle described. It’s mostly faithful to the original story, though some changes are made. 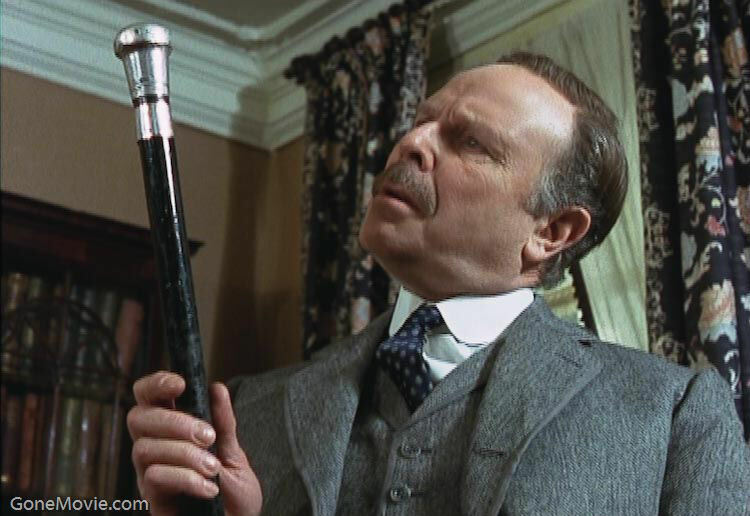 (Lestrade doesn’t appear; instead, Dr, Mortimer is made younger and has a considerably beefed-up role.) This version also the best-looking hound; this time, the canine phantasm is covered in phosphorous and glows in the moonlight- like in the book. 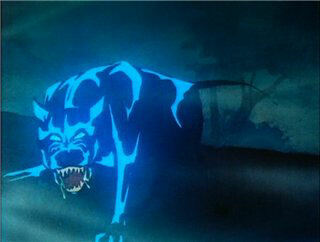 (Previous live-action versions just used a dog; Hammer’s film put a nasty-looking mask on the mutt.) The only drawback is how slow this film feels. Though similar in screenplay to the animated version, this Hound lacks the tight, careful pacing and can actually be a little boring. That is, until Holmes makes his re-appearance. 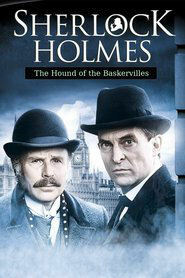 Holmes: Jeremy Brett’s Holmes is regarded as one of the finest (easily rivaling Rathbone). At first, in the London scenes, I felt he was too brooding. 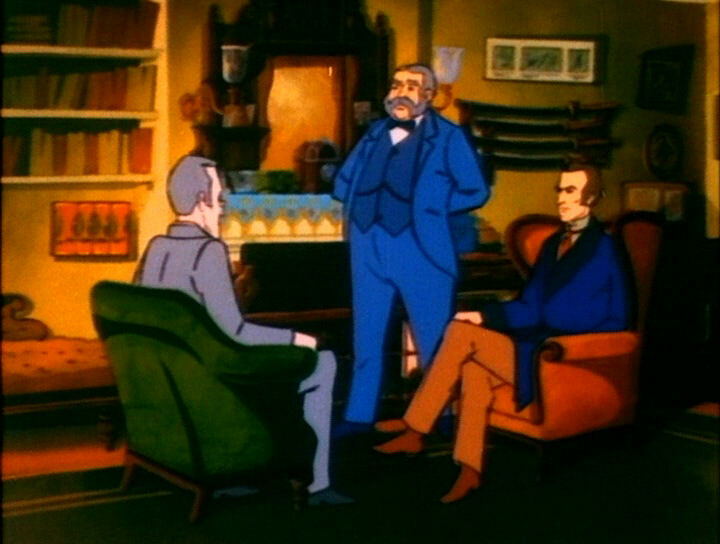 However, when Holmes appears on the moors to Dr. Watson, Brett takes control of the show. He has an energy and determination that makes him very interesting. He also shows Holmes least seen trait- empathy. Holmes shows he happy that Watson is safe, given what’s going on. He also has incredible pity for Laura Lyons, the woman tricked and manipulated by the villain. Brett shows just how much Holmes feels for the victims of this story, and how much he wants to find whoever is responsible. 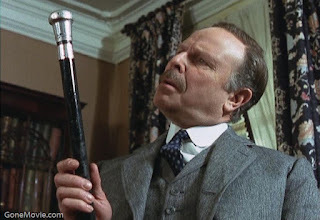 Watson: Edward Hardwicke comes the closest to the print version of Watson. For one thing, he’s not a doddering, old fool. (In the canon, he’s only one year older than Sherlock, who’s roughly 35 in Hound.) Though he lacks the Great Detective’s imagination, this Watson shows you why he’s Holmes’ right-hand man. 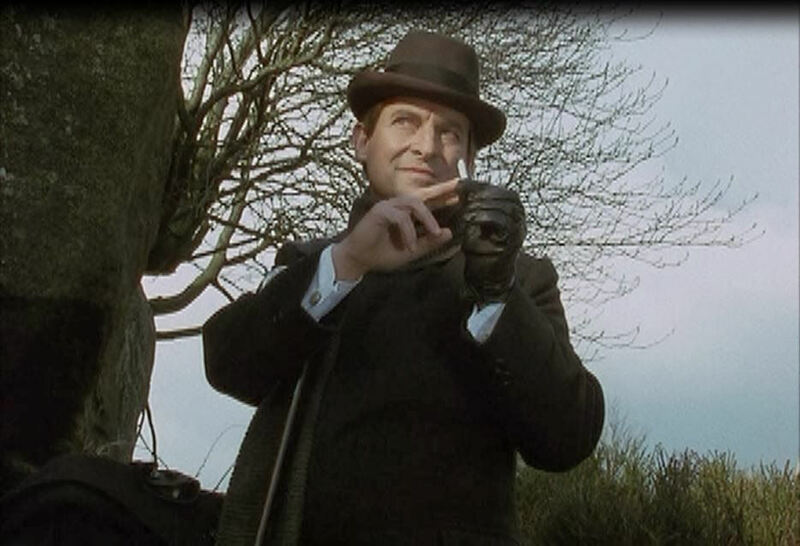 Jeremy Brett was, and is, the best Sherlock Holmes. Full stop. Really? Nobody else is commenting here? What the hell? The writer Edgar Wallace, (in)famous for the Colonel Sanders series about a District Officer in British Colonial Africa (which has some rather patronizing attitudes towards the natives), wrote the screenplay for a 1932 adaptation. Never seen it. Just thought I'd bring it up. Rustbelt, Thanks for the article! :) Sorry I haven't been around much today. It's been one of those days. We've had a rough day, Kit. I'll try putting up a link in Andrew's next article at the politics site. This is the first time I saw Brett playing Holmes. After watching several versions of the same story, I though I'd seen it all. And, to be honest, it took a while for this version to get going. But I have to say, once Brett reappears as Holmes, the whole production comes alive. I've rarely seen one actor get a story going as well as Brett does in his version of 'Hound.' He truly makes the Great Detective come alive. You're welcome, Andrew! And I can empathize about having a busy day- just like Mr. Brett's Holmes! There was also a BBC miniseries of THotB in 1982 starring The Man himself, Tom Baker of "Doctor Who" renown. They de-curled his iconic hair and fashioned it into an odd pompadour. Blasphemy. Baker himself has expressed dissatisfaction with his performance, but he was probably still on the sauce at the time. I enjoyed the Benedict Cumberbatch version as well. All of the the new Sherlock's have been excellent. I'm surprised you didn't mention their version. 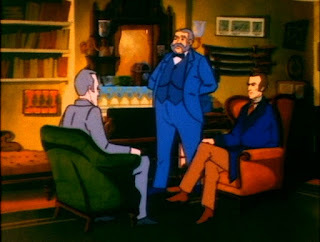 I watched the old animated Sherlock Holmes episodes years ago and enjoyed them and recently found them on YouTube and watched a few of them again...they held up well. It would be interesting to see Guy Ritchie's take on it with Robert Downey Jr and Jude Law. Sorry didn't comment earlier. I read the book years ago and I believe I saw the 1939 version years ago. I remember the story itself as very good but I should go back and re-read it. I recently saw the updated version on Sherlock with Cumberbatch and I thought it was done well. The conflict of Holmes not believing in the supernatural but also unable to explain what happened is awesome. Rustbelt, like Voz states earlier, I'm surprised you did not include RDJ and Jude Law's version of Holmes and Watson. Also, the newest one with B. Cumberbatch and The Hobbit. I know neither one did HoftheB I would love to hear yours, and others here, comments on the depictions of Holmes and Watson. Both are done okay....not as welldone as Brett of course. 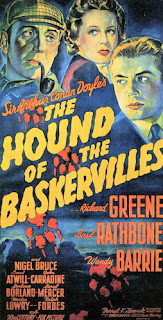 The Guy Ritchie version (RDJ) of Holmes is a fantastical version, not only of Holmes but of Victorian London as well. Of course he's a martial arts master (as is any hero in today's movies...male and female), a magician and with superhero powers. That's what made AC Doyle's Holmes so real. The pure deductive reasoning he used to solve crimes. Not Flying through the air or with magical devices. Such a waste. Cumberbatch's Holmes is different as it is and updated version of London. Holmes is now an internet sensation that Watson blogs about on a regular basis. 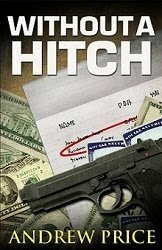 They stick pretty much to using his deductive skills to solve crimes, but still occasionally resort to using the internet when they don't know how to get past a tricky, unusual situation. Where Doyle's Holmes would figure it out....logically....the new Holmes has Watson use the internet to provide the clues to solve the mystery. Other than the above, I'll watch anything that depicts 221-B Baker Streets' inhabitants....in any time setting. The many nights watching Brett's Holmes on Masterpiece Theatre are part of my personal family history and I miss them greatly. Also, having the Complete Annotated Sherlock Holmes since I was a young man has made this character a part of my life's outlook for many many years. Thank you for selecting this as your Commentarama Films blog this week.